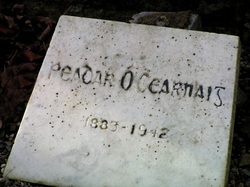 The Irish national anthem "Amhrán na bhFiann" or in English "A Soldier's Song", was written by Peadar Ó Cearnaígh (Peader Kearney) and put to music with Patrick Heeny. It was first published in 1912 and in 1926 became the official national anthem of Ireland (replacing God Save Ireland). died in Inchicore, Dublin on the 24th of November 1942 and is buried in Glasnevin Cemetery, Dublin. Seo libh, cana'dh amhrán na bhFiann.